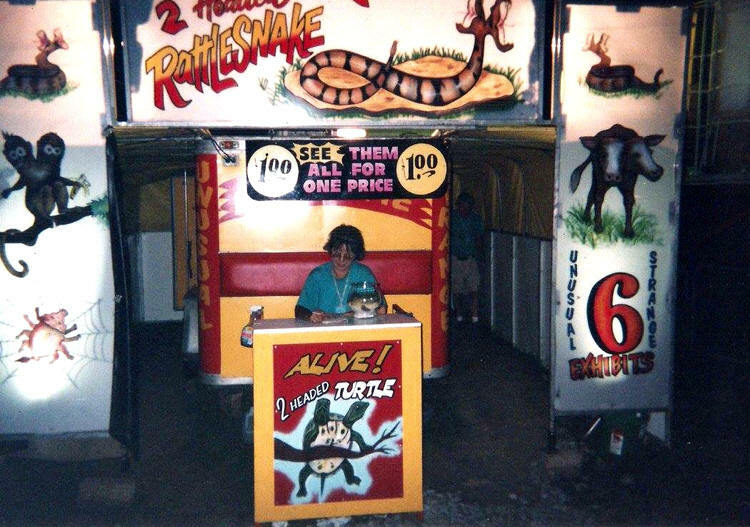 Around 1990, I was playing the Missouri State Fair in Sedalia, MO. 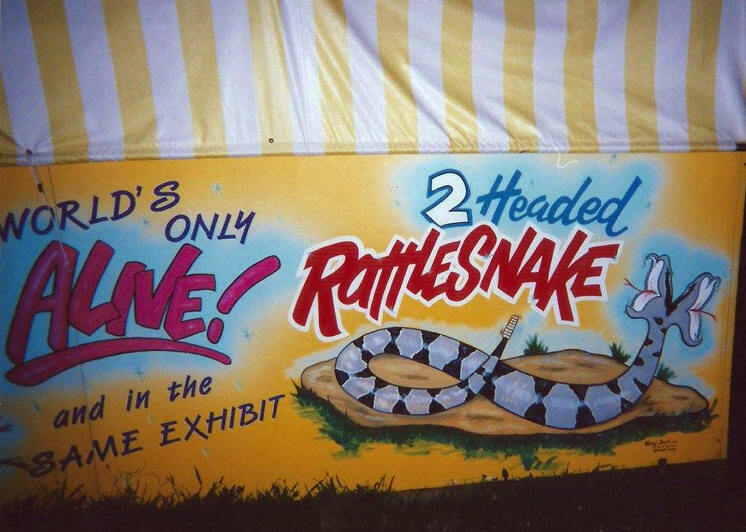 I had up an 80' rag front or bannerline circus sideshow. 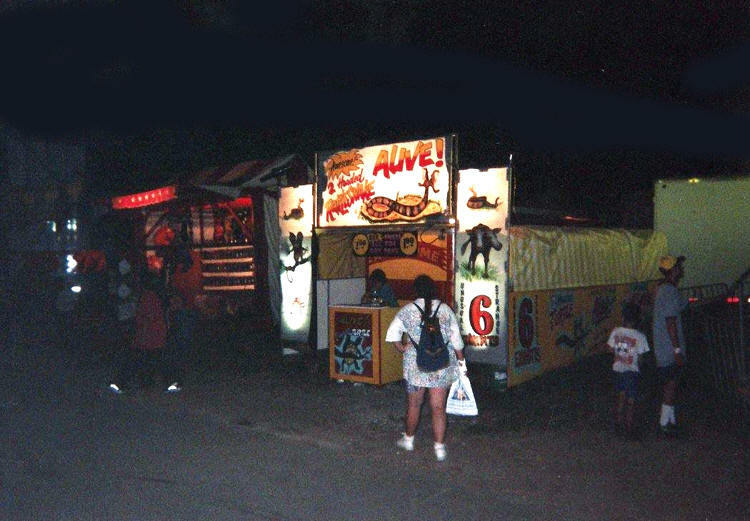 There was an older couple that had a six by twelve trailer with pop up signs like a fun house. We got to talking and he pulled out of a little ice chest a little two headed red eared slider turtle. His name was Fred Lally and I was amazed how he was feeding this two headed turtle pieces of raw hamburger and interacted joyfully with each other. I was amazed in another ice chest where he pulled out a live two headed timber rattlesnake that he named double trouble appropriately. 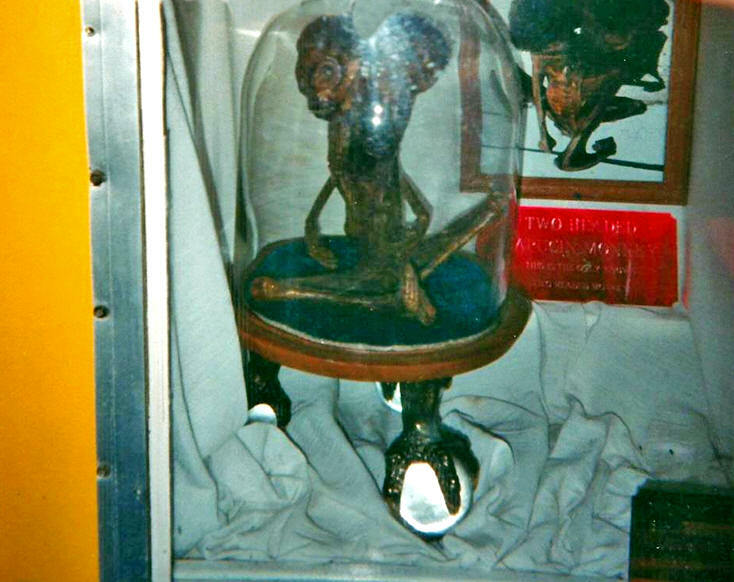 He also shown me a mummified Capuchin monkey with two heads that originally came from South America. He also had a two headed stuffed cow and an eight legged stuffed pig. 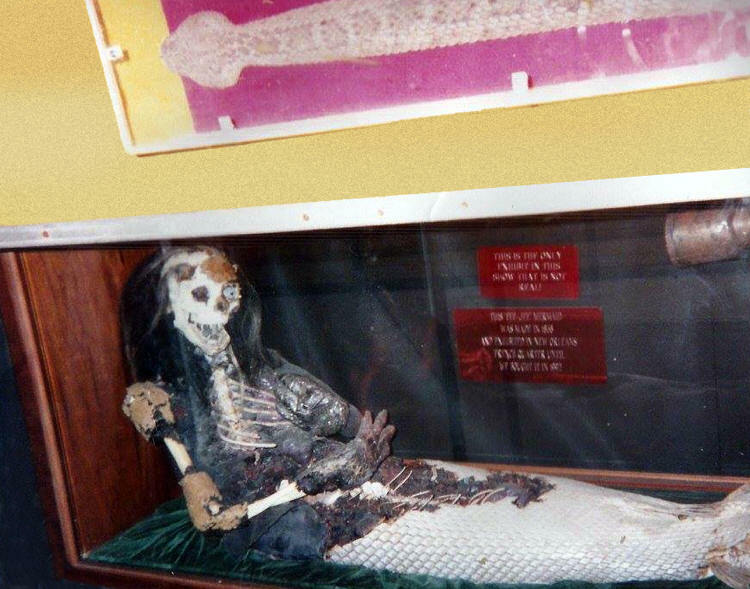 I remember a feejee mermaid that he created with his own hands. I was so inspired with his attractions that I decided I had to get live two headed animals in my own show. 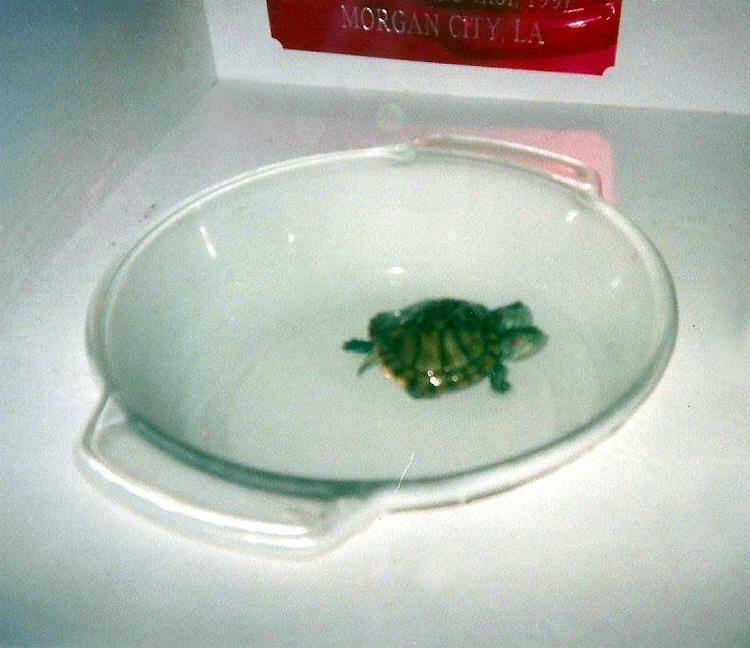 I saw a little red plaque above his turtle that said "Morgan City, LA". At the end of the season, I rerouted my entire show to play the Greater Baton Rouge East State Fair (now just the Greater Baton Rouge State Fair). I also asked Fred where he acquired and purchased his two headed turtle. He told me a black man hunts turtles in Morgan City for turtle soup and he found it out of the hundreds of thousands of turtles he collects for his turtle soup business. When I got to Baton Rouge, I immediately went to Morgan City and talked with the secretary at the chamber of commerce. I asked her a bout a blackman in town that might be collecting turtles, wild turtles. The lady said there's no black man collecting turtles in Morgan City, but there are turtle farms that raise them by the thousands in adjacent towns to Morgan City. Once such town was Pierre Part, which was my next destination. I drove into the gas station and asked if they knew any turtle farms. 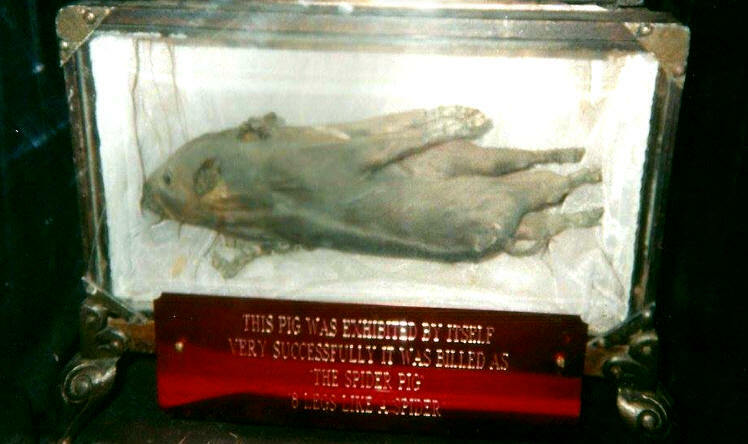 The attendant said, "Yes, I know Paul Hebar, check with him..." I went over to Paul Hebar's address and asked if he was the man who sold Fred Lally a two headed turtle and he said he was. He said he had two more two headed turtles and that if I wanted any, he'd sell them to me for 500 a piece. I was thrilled and bought them on the spot. When I got them to the fair, I put them on my trailer's kitchen table they both ran across the kitchen table... both very healthy and very active. I went to the local drug store to buy a heating pad to keep them warm at night. That was a bad move because I turned the heating pad at night and the turtles were burnt to a crisp, a chalk black color and dead. I made a promise to myself that morning that I would not stop until I found another live two headed turtle. Turtle season was over and there wasn't another one in the whole United States. I did find a live two headed conjoined tortoise in Ft. Myers, Fl, where I rerouted my show after the state fair in Louisiana. I immediately bought the conjoined tortoise for $4000 and was thrilled to have him. The tortoise lived for ten years and was a sensational attraction. 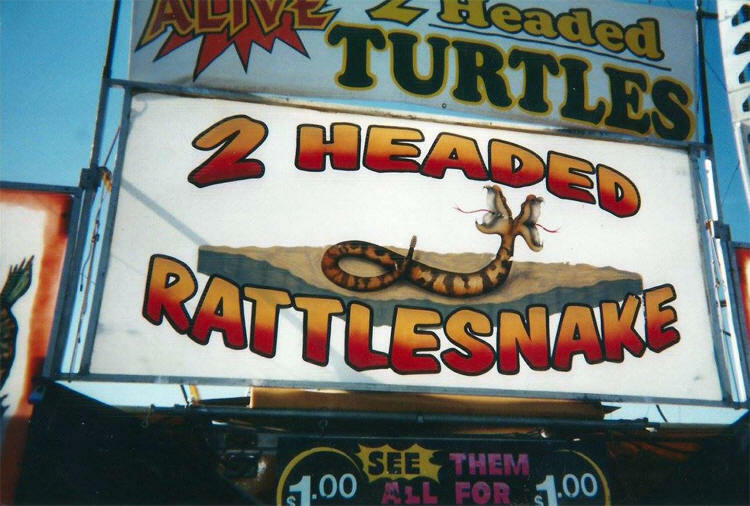 When I came back to the Baton Rogue State Fair the next season, I bought eight two headed turtles from Paul Hebar's two headed turtle farm. For you see not all two headed turtles make it unless their inside plumbing is sound. However, a turtle has such an instinct to live that it can go three months without eating, drinking or excreting because it has a food sack built into the turtle that can last for three months without them finding food. Every year I've acquired more and more two headed turtles. I've had over 50 two headed turtles since the 1990s. One of my turtles is 14 and the largest two headed turtle in the United States. Fred lost his timber snake and found a two headed diamond back rattlesnake, which is now over 8 feet long... a very impressive reptile. He also bought a two headed albino rat snake in Seattle for $30000 that lived for eleven years, another very outstanding reptile. 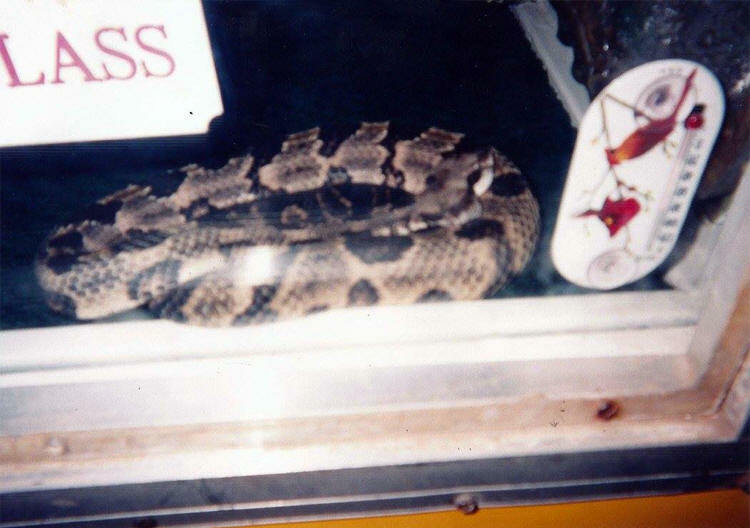 I went on to buy a live two headed bull snake. Fred Lally has gone on to the Dallas State Fair, where he's been in since 2002 grossing more in three weeks than the average American family makes in a year. I've supplied two headed turtles to Jimmy Zajicek and Rick West of Northern Texas. 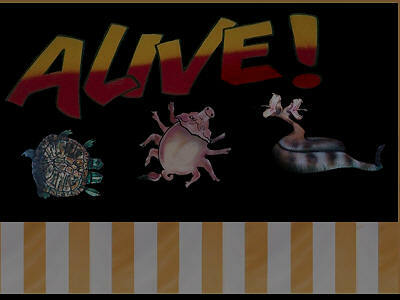 I shown Todd Ray of the Venice Beach Freak show his first sight of eight live two headed reptiles. Todd Ray has gone on to purchase 29 two headed reptiles I've also gone on to buy the world's only live two headed cow in existence in the world. Two heads are better than one.